I’ve not been back long from a short evening wander. My camera is malfunctioning and I had to resort to the camera on my phone. It’s a rather old mobile phone with a basic camera, so please excuse the quality of the accompanying imagery. We’re in the Bootham area again, as I ended up wandering through the grounds of Bootham Park hospital. While passing the chapel in the grounds I remembered I’d never followed up on Silvanus’s special door. Last year I included a page on the lost street of Union Terrace. It’s not completely lost – there’s a bit of it left – but it was at one time a long street, as can be imagined from the car park which now occupies the site of most of it. 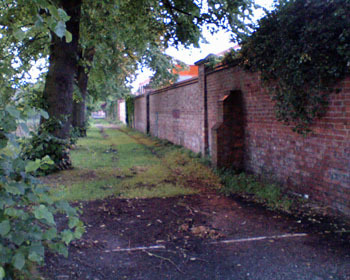 Between the car park and the grounds of Bootham Park Hospital is a boundary wall, which presumably used to mark the end of the backyards of the demolished houses. Silvanus Thompson once lived on Union Terrace, on the other side of this wall. The name might not mean much to most readers, but his son, Silvanus Phillips Thompson, is commemorated in a plaque on the front of Bootham School, not far away, and must have born here in Union Terrace. The front of Bootham School, as its name suggests, is on the street of Bootham itself, but its grounds are large, and stretch back to near the hospital chapel, and the back of Union Terrace. I was wandering by this evening, remembered this, and thought I’d have a quick look to see if there was any indication where the doorway had been. No visible trace in the brickwork. But there were a couple of bits of graffiti. 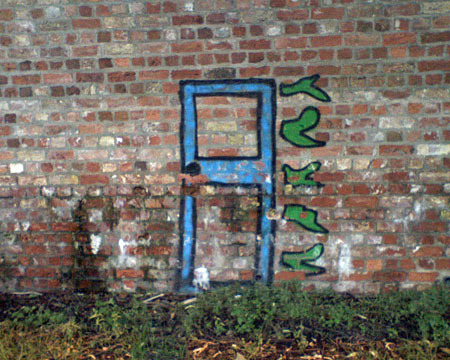 Including – amusingly, weirdly – a door. A 21st century painted echo of Silvanus’s door.